Confessions of a Comics Shop Junkie No.12: Black Widow #1 and more. Once more into the breach with Confessions of a Comics Shop Junkie, in which I attempt to point out various offerings of a sequential graphics-type nature that I think might be worth your time to check out, or in some cases, avoid- many of which will still be on sale at various booksellers, both online and real-world, near you. The Natasha Romanoff Black Widow, first created as a Cold War Mata Hari-type sent here to seduce and steal secrets from Tony Stark aka Iron Man, has certainly had a long and somewhat unusual character history. After kicking around as a villainess for a while, Stan or Larry Lieber or Don Heck or someone decided to give her some weapons tech and even later a skintight black spandex superhero suit, and eventually she crossed over and became a “good guy”, even joining the Avengers. I won’t recap the multitude of things they’ve done with her here; you can find that elsewhere– and it’s kinda irrelevant to this particular series and my impressions of same. Since the character has been worked in to the upcoming Iron Man movie, portrayed by Scarjo no less, the Powers That Be at the House that Stan and Jack and Steve and Don and Larry and… built have been going out of their way to bring us a spate of appearances by the character, in hopes of launching a title that maybe, just maybe, might break the 10,000 copy sales mark…and this is the latest. It piqued my interest because of Acuna’s name in the credits; I’ve enjoyed his work on titles like Uncle Sam and the Freedom Fighters for DC, and was curious about what he’d bring to the table here. The answer is, quite a bit actually- he’s gaining assurance and polish, even as his style, somewhat reminiscent of Alexander Toth and Gray Morrow as well as more recent people like Batman Year One-vintage Dave Mazzuchelli or Alex Maleev (with a little more Photoshoppery) has become a bit rougher and less fussy. Scripter Liu plays this close to the vest, with dare I say even a hint of the tersely-dialogued approach that Brett Lewis applied to his Winter Men, that also dealt with Soviet super-soldiers and how they interact in the “real world”. The opening scene, in which Natasha looks up an old colleague of sorts to get information about a mysterious envelope and its contents, was very well done. Then, she’s accosted by a surprisingly good old lady fighter (shades of Rosa Klebb from From Russia With Love!) and subdued by a tranq dart from a second person, who then proceeds to cut her open and do something- what, we’re not told- and then we get a somewhat disorienting array of flashbacks and flashforwards and freaking Wolverine and the cocky surgeon again and…well, I was wishing we could go back to the beginning and start over before it was done. I’m sure all will be revealed, hopefully in a more linear fashion, and with Acuna at the helm it will all look good. There’s promise here of becoming something more than yet another here today, forgotten tomorrow movie tie-in comic, and I hope the storytelling gets tighter so it will realize it. Where at least Blackest Night had a sense of ghoulish Schadenfreude about it, its immediate sequel brings nothing of the sort, only promising the sort of creatively bankrupt deckchair shuffling that has become, by and large, the province of the Big Two as they strive to captivate their ever-decreasing following, shell-game like, while all the while striving to perpetuate the license with one eye on merchandising bucks and Hollywood licensing fees. It’s a number zero issue, so that means stage setting; we accompany Deadman, now alive apparently (“Liveman”?) as he is transported hither and yon to look in on various superpeople, recently brought back to the land of the living, to find out how they’re handling their recent revivals. What he finds is a varying range of very uninspired scenarios, some rife with continuity and just plain common-sense gaffes. I can’t believe after all the sturm und drang yet again with the Hawks, we’re going to go once more to the whole dried up love and conflict and reincarnation throughout the ages well. And on it goes- Barry Allen getting all badass with the equally newly revived Captain Boomerang- inconsistent characterization since CB was proven to be ten times as badass as the mostly vanilla Barry Allen Flash, an incarnation, by the way, that only about 12 people in the world wanted to see happen, none of them younger than 45; the most familiar Arthur Curry version of Aquaman standing around being all pensive (yes, he actually says at one point “I have this bad feeling”) and stuff, not getting in the water (even though it was established that he couldn’t survive outside the water for an extended period of time; Fratboys pouring beer out of a keg on someone at a party for the newly-alive Ronnie Raymond aka Firestorm, even though no fratboy worth his salt would waste good beer like that…and I don’t know if the artist has ever tried to tap a keg before, but the design doesn’t lend itself to pouring…Max Lord’s still a bad guy, and the DC party line remains to look down upon the more lighthearted Giffen/DeMatteis League that way; Hank (“Hawk”) Hall and the Dove are off fighting in some wartime hot spot, Hawk engaging in a covert action of some sort that the US government would most likely have serious problems with…and so on. Lazy? Maybe. Sacrificing internal consistency for the greater good of the story? Perhaps. Regardless, it’s kinda sad that all that the writers could come up with for this bold new direction of the entire DCU merely hinges on plot threads that have been done over and over again for the last three decades. It’s a “Forward into the past” approach that really seems like a zero-sum game from where I’m standing. I’ve seen much better work from Tomasi, specifically Light Brigade and The Mighty, but this sort of exercise doesn’t play to his strengths. Johns seems to be the one riding herd via plotting and while I’ve been known to enjoy his work from time to time as well, he all too often lapses into cliche and melodrama, both amply in display here. The art isn’t terrible, just terribly, terribly professional- aspring to the pseudo-realism of Bryan Hitch and Paul Neary, and coming pretty close, but like Bill Sienkiewicz was always a poor patch on Neal Adams until he developed his own style, this sort of “sincerest form of flattery” work is underwhelming by its nature. Of course, the standard issue disclaimers for reviewing #1 issues apply; this may get better after a while. 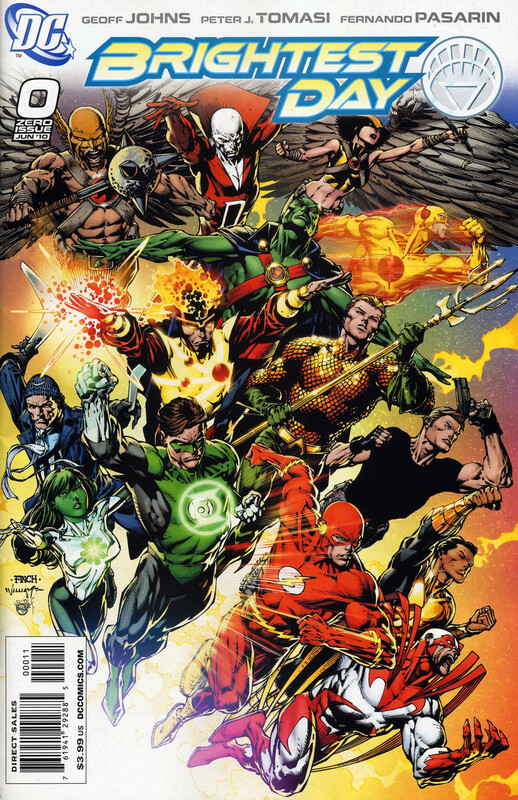 Recommended for those, god help them, who think the last five or so years’ worth of mainstream DC Universe comics is by far the best way to do superheroes. All others feel free to avoid, and besides, we all know that this will get retconned in the next 5-10 years anyway. 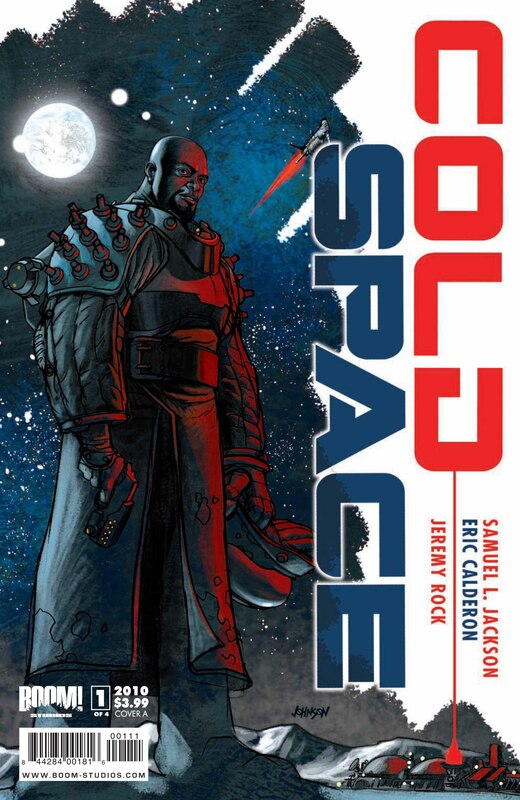 Script: Samuel L. Jackson, Eric Calderon; Art: Jeremy Rock. Remember last week? Truly, we ARE in the Era of the Celebrity Comic Book Writer. After years of people like Marvel using Samuel L. Jackson’s likeness whenever a badass brother-type is needed, it was inevitable, and only fair, that the man himself would want to get involved one of these days…and that day has come. Sam is given a co-writing credit here, though I remain skeptical about his involvement other than the desire to have a potential film project all storyboarded out for him, or maybe something to give his grandchildren. Anyway, the matter at hand- we meet an rascally, he’s not that bad outer-space wanted crook named Mulberry, and the outer-space cops that want to catch him in the worst way. Of course, he eludes them in clever fashion, but a warp drive accident as he escapes finds him somewhere on the other side of the universe, on a planet full of people that look and act like someone decided a Mad Max/Deadwood mashup was the happening thing to be. His interactions with the locals, as he tries to figure out where he is and how to escape, will (I’m sure) make up the bulk of the next three issues. Despite an utter lack of originality or any success capturing the film persona that Sam L. brings to the party (it would help if the fair-to-middling artist could draw a decent likeness), I suppose one could get interested in this, especially if one is not especially demanding when it comes to their comics reading; or such a Sam Jackson fan they he or she has to have everything the man is involved with, no matter how marginal that involvement may be; or maybe if you’re a collector of covers by Dave Johnson- he turns in a good’un here; or perhaps just to find out if I’m right about the direction it will take. Doesn’t sound like a good reason to spend your hard-earned money to me. Script: Paul Malmont, Jason Starr; Art: Howard Porter, Art Thibert, Scott Hampton. 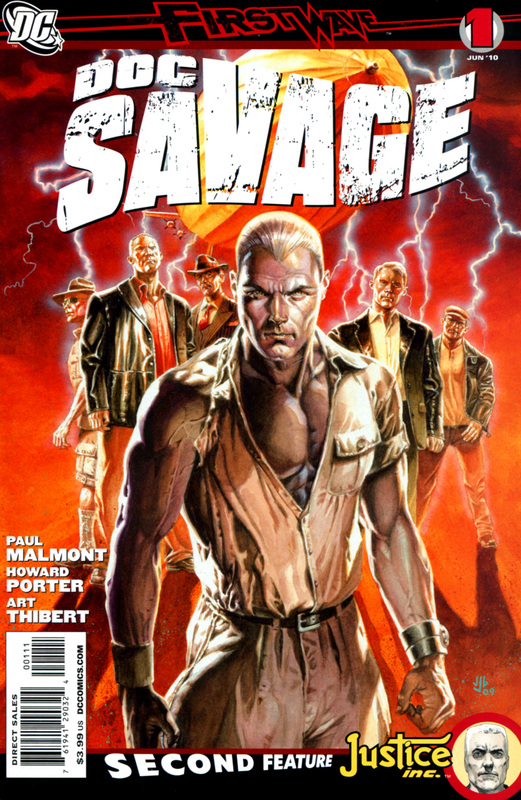 I’ve read my share (read: most) of the Doc Savage pulp stories, and I’m a bit of an aficionado. So, I’m kinda picky about my Doc comics, I guess, even though I probably shouldn’t be; let’s face it, the comics readership, hell, society in general is more knowledgeable and sophisticated (I do believe this, in a general sense) than the audiences of the 1930’s, and stuff that was exciting and provocative back then just seems stale and quaint now. So that’s why the only pulp revival that actually worked, at least on an aesthetic level (and in my opinion, of course) was the Chaykin/ Helfer and Baker Shadow of the mid-late 80s, an approach so slash-and-burn in its nature that it paradoxically refined the essence of the character and made him fresh again. Another, more obscure pulp figure, the Avenger, also benefited to a lesser extent from the Helfer/Baker creative revisionism, but the attempt was a non-starter. More on that later. Anyway, Malmont has done a credible job of bringing us a suitably apocalyptic threat for this, the First Wave Man of Bronze, as lightning strikes from the sky, targeting Doc, his building, and his associates, and the Bronze Man has to scramble to deal with the damage. He does a good job of capturing the established pulp personas. He’s not helped by Porter, whose strengths- kinetic, exciting, fast-paced storytelling (best stuff- his stint drawing JLA for Grant Morrison) are often negated by a downright bizarre approach to depicting the human figure- he gives us the worst Monk and Ham I’ve ever seen, and the nuances of clothing and fabric seem beyond his grasp. Some of this has to be laid at the feet of Thibert, but both are experienced vets who should be better than this. The Avenger backup is actually a bit better- Scott Hampton is a longtime pro whose work doesn’t get seen in comics nearly enough, and he illustrates this in an odd sort of Gene Colan-meets-Gene Ha style, which works well against all reason. Writer Starr has concocted a tale in which Richard Benson (the Avenger’s real name) has to find one of his kidnapped associates, and it holds some promise. Starr has a matter-of-fact style that isn’t flashy, but it’s sound. Jury’s still out on these First Wave books (and I haven’t read The Spirit yet), but they’ve been better, by and large, than I expected. And that’s it! Back next week for more. Also, if you’ve got the money, please consider bidding on the trove of art and other collectables that have been assembled to benefit the great Gene Colan, who has recently injured his drawing shoulder, and whose income in large part is derived from commission sketches. Go here to find out more.